I Bianconeri won their last game with an impressive comeback over Milan. After falling behind to Krzysztof Piatek's opener, Paulo Dybala equalised from the spot before Kean struck the winner. Here's how Juventus could line up for Saturday's match. 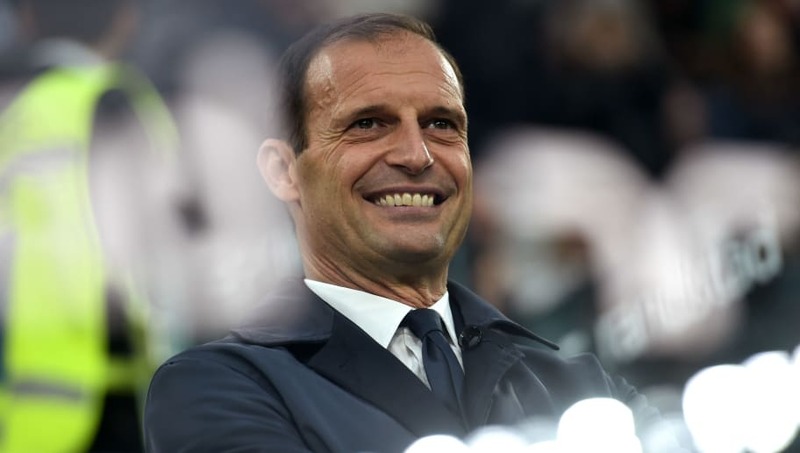 Mattia Perin (GK) Wojciech Szczesny is regarded as Juventus' top goalkeeper, but Allegri confirmed on Friday that Perin would start ahead o the Pole. Mattia De Sciglio (RB) - With Joao Cancelo featuring on Wednesday against Ajax, De Sciglio is like to get the nod. Having always deputised well, it's logical Cancelo will be rested given the opposition and the fact that the league is all but wrapped up. Leonardo Bonucci (CB) - In Giorgio Chiellini's absence, Bonucci may have to forego a rest, with Daniele Rugani and Martin Caceres being an unconvincing partnership. Bonucci will be needed for his experience with Rugani still developing his game. Daniele Rugani (CB) - With usual starter and captain Chiellini missing the Ajax match through injury, it's unlikely he'll be risked here. Rugani will benefit most from this, starting in his Italian teammate's place. Leonardo Spinazzola (LB) - Spinazzola will be disappointed to have played as little as he has this season, given how well he has done when given the opportunity. With the team likely to be rotated, Spinazzola could be in line for a rare start. Rodrigo Bentancur (CM) - Having played very little last season, Bentancur has become mainstay in Allegri's team. With SPAL likely offering a physical game, the Uruguayan could be deployed to help counter this. Emre Can (CM) - Can is yet to nail down a consistent starting spot at Juve. Injuries haven't helped but the former Liverpool star has mainly come in as back up for Pjanic at the base of a midfield three. With Pjanic in line for a rest this Saturday, Can should feature. Sami Khedira (CM) - Not the player he once was, Khedira has seen his role reduced to more of a backup player. No longer first choice for big Champions League clashes, Khedira will have to settle for games like this. Paulo Dybala (RW) - Dybala was again the big absentee on Wednesday night. Seemingly unable to strike up a partnership with Ronaldo, the Argentine has found himself relegated to either coming off the bench or starting smaller games. This Saturday, Dybala has the chance to lead Juve's attack and prove his worth. Moise Kean (ST) - At just 19, Kean has exploded onto the scene this season, scoring six league goals in very limited minutes. The teenager's most recent strike was the winner against Milan. With many claiming he should have played against Ajax, he's sure to be involved this Saturday having missed out midweek. Juan Cuadrado (LW) - The Colombian mainly features on the right when he plays but could swap over to the left after Allegri confirmed he would start on Saturday.